On October 9, 1949, the Bureau of Posts issued a set of three stamps and a souvenir sheet to commemorate the 75th anniversary of the Universal Postal Union. 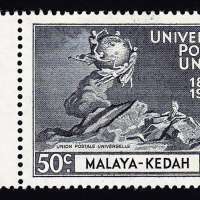 The stamp design featured the UPU Monument unveiled in Berne, Switzerland in 1909. The monument consists of a central image in which five women, representing the five continents, are passing letters around the world. 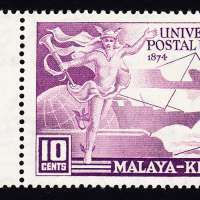 The Universal Postal Union (UPU) is a specialized agency of the United Nations that aims to organize and improve postal service throughout the world and to ensure international collaboration in this area. 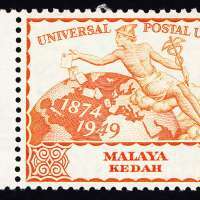 Among the principles governing its operation as set forth in the Universal Postal Convention and the General Regulations, two of the most important were the formation of a single territory by all signatory nations for the purposes of postal communication and uniformity of postal rates and units of weight. The original agreement adopted in 1875 applied only to letter mail; other postal services, such as parcel post and international money orders, have been regulated by supplementary agreements that are binding only on signing members. The first attempt to agree upon general rules concerning the international postal service was in 1863, when United States Postmaster General Montgomery Blair called a conference in Paris. Delegates from 15 European and American countries met and succeeded in laying down a number of general principles for mutual agreements. But the scope of their decisions was limited and they were not able to settle on an international postal agreement. [Signature of J.P. Hofstede] On 9 October of the same year - a day now celebrated throughout the world as World Post Day - the Treaty of Bern, establishing the General Postal Union, was signed. For the Netherlands the treaty was signed by J.P. Hofstede (general director of the Dutch Posterijen) and Coenraad Willem baron Sweerts de Landas Wijborgh (1820-1892, director of the Posterijen in Rotterdam). The union actually came into effect on 1 July 1875. 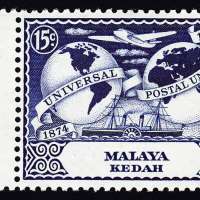 Membership in the Union grew so quickly during the following three years that its name was changed to the Universal Postal Union in 1878. On 1 July 1947 the UPU became a specialized agency of the United Nations. At the moment the UPU has 191 member states. Out of 192 UN member states, 188 are UPU members. The situation of Andorra, Marshall Islands, Federates States of Micronesia and Palau is not yet settled. Two groups of territories are ranked as a member state: Netherlands Antilles and Aruba, and Overseas Territories of the United Kingdom. Vatican City is also a UPU member state. [UPU2-20] Some member states also represent their dependent territories and these territories are deemed to fall under UPU jurisdiction: Australia (Norfolk Island), China (Hong Kong, Macao), Denmark (Faroe Islands, Greenland), France (French Overseas Departments and French Polynesia, French Southern and Antarctic Territories, New Caledonia, Scattered Islands, Wallis and Futuna), New Zealand (Cook Islands, Niue, Tokelau), United Kingdom (Guernsey, Isle of Man, Jersey), United States (Guam, Puerto Rico, Samoa, Virgin Islands of the United States of America, Northern Mariana Islands). The Northern Mariana Islands are still listed as Trust Territory of the Pacific Islands. Samoa is better known as American Samoa, to distinguish it from the neighbouring state of Samoa. The Universal Postal Congress is the legislative body and meets every five years. The Executive Council, which consists of 40 representative countries elected by the congress, ensures the continuity of the work of the UPU and meets annually. The International Bureau is maintained at Bern and acts as a secretariat in carrying out the daily operations.